one-light wall fixture. 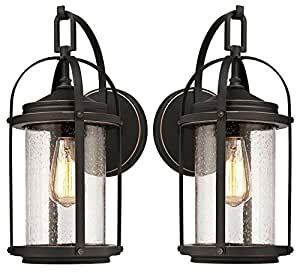 This wall lantern adds a warm glow with clear seeded hand blown glass and a rich oil rubbed bronze finish with highlights. Light up a front or back entryway with this extraordinary fixture. Install it on a porch or balcony for attention-grabbing illumination. This outdoor fixture’s timeless design and durable craftsmanship ensure lasting style and beauty. It is backed by a five-year limited warranty against defects in materials and workmanship.